This page presents a summary of my paper entitled "Political Economy of the US Financial Crisis 2007-2009" in which I analyzed some of the policies preceding the crisis that could have had an effect on the housing bubble and the consequential recession. Any comment and/or constructive criticism is more than welcomed. The paper begins with an international perspective on the current crisis. It focuses around the United States in particular because of its central role in the inception of the crisis which spilled over onto the rest of the world’s financial markets and hence brought about the worldwide recession. Subsequently the paper endeavours to explain opposing views about the causes of the crisis. It continues with a description of the mechanism of adjustable rate mortgages and offers a perspective on increasing bank risk-taking, the burst of the housing bubble and the spillover effect to the real sector of the economy. In chapter four the paper examines the political and regulatory inducements of the crisis. It covers the impact each of them had on the economy and possible reasons why the policy-makers instituted them. These causes include the general regulatory enhancement of systemic risk by the policy-makers with the unintended consequences on bolstering the crisis, the role of government-sponsored enterprises and the legislative solutions in housing policies, and the role of rating agencies. An assessment on whether monetary policy had implications in creating the crisis and the housing bubble is given in chapter five with help of the Taylor rule. Finally in chapter six, the rising influence and political power of the financial industry is portrayed as possibly the decisive factor of the crisis. 1) Government sponsored enterprises (Fanny Mae and Freddie Mac), whose goal was to "purchase mortgage loans from banks on the sub-prime mortgage market. They could then either keep these loans as monthly source of revenue or to sell them as mortgage-backed securities (MBSs). The banks used the money from selling their loans to acquire new mortgage-based securities and the entire cycle is continued." The creation of mortgage loans and MBSs gave rise to its prices and its demand. The GSEs owned half of all american MBSs and half of all low and moderate income mortgage loans, according to the Housing and Urban Department (HUD) - see table 2 in the paper (pg. 104). The GSEs were the main players in the US sub-prime mortgage market. They quickly achieved a dominant position and were following the targets set by the HUD. Finally, "the Fed has done a study that showed the GSEs were not even successful in reducing interest rates for middle-class home buyers—the central justification they always claimed for their existence." 2) Community Reinvestment Act and its 1995 revision which pushed for affordable housing for everyone, by making banks "issue more mortgage loans towards unprivileged social groups such as minorities ... Loan requirements were softened due to short-run interests of politicians thinking only of how to win the next election and remain in power. The affordable housing idea proved to be nothing else than a political trick." 3) Rating agency oligopoly - Moody's, S&P and Fitch "were set as NRSROs (Nationally Recognized Statistical Rating Organizations) and they were the only ones good enough to comply with SECs regulatory requirements in order to evaluate the riskiness of a security... The effect was that these rating agencies, although private, due to their oligopoly position, could use any techniques they wished for evaluating riskiness of a company or an asset ... If the rating agencies are making bad decisions and therefore sending wrong signals to investors they don’t account for their decisions because they are being protected by their oligopoly status. Their imprecision and bad evaluations couldn't have hurt them in terms of making a profit because they didn't have any competition to punish them for doing a poor job. According to Friedman (2009) “Moody’s hasn't updated its main statistical assumptions on the American mortgage-backed securities market since 2002. This means that the dynamics of an unprecedented growth on the real-estate and the mortgage market wasn't taken into account at all”. Such behavior could have been prevented in an open competition credit ratings market in which imprecision and neglect in estimates would have been punished by the loss of reputation, clients and money." 4) Recourse rule - steering banks' investments into 'safe' assets. The most important factor in the crisis. Back to the US. Increased demand for MBSs saw banks issuing more and more mortgages in order for the GSEs (Fanny and Freddie) to repackage them into MBSs and sell them back to banks to fill out their capital requirement. This artificially created demand for MBSs resulted in an artificially created demand for housing and led the banks to lower lending standards in order to issue more and more mortgage loans. It was a self-perpetuating cycle of artificial demand spurred by a regulatory desire to make banks safer. The regulators always have the best intentions, but in having a desire to plan and create a stable system, they paradoxically do exactly the opposite and become the drivers of instability and increasing systemic risk. 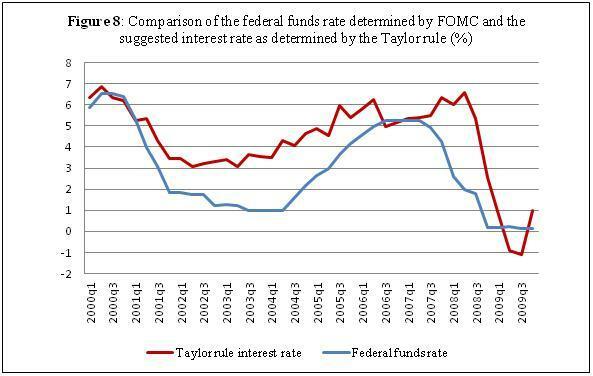 However, “the main assumption of the Taylor rule is that output and inflation are the main policy goals of the Fed. The Fed's main policy goals are stable prices, maximum employment and moderate long-run interest rates, which should eventually lead to a stable output and growth levels." Therefore, one could argue that the Fed lowered the policy rates and kept them so low due to a jobless growth following the 2001 recession. "Nonetheless the rates were low enough to create a favourable environment for the bubble growth, but had little to do with its rapid bursting and the fact that the demand on the housing market rose so rapidly." It is simpler than this. It is not a pure matter of economics. Wall Street walked off with FNMA's securitization process, utterly unregulated. As a government agency, there had been no SEC antifraud scrutiny on Fannie's activities. Wall Street was aware of the securities issue, but of course didn't care to comply with the tough due diligence and disclosure requirements that, by law, all enterprises resold to the public (which MBS and CDOs are) must be subjected to. The SEC and banking regulators charged to protect the public against bad securities were so mired in petit detail and regulatory over-convolution in their massively stovepiped regulatory arena (being also relatively clueless and underpaid amateurs when it comes to Wall St), they didn't bother to notice that Fannie's securitization process had only been workable because (a) it had been conducted under strict rules such as 20% down (a vast improvement on the market terms for mortgages in the 30s which according to Raghuram Rajan in FAULT LINES (Princeton 2010) were on the order of 50% down and 5 years to pay off) and (b) because Fannie was a 100% taxpayer guaranteed government agency and national insurance style monopoly program, not a Wall St. banking competitor. This government process could not be just passed over to Wall St., unless Wall St. was subjected to ordinary securities law scrutiny, as the law in fact provides. (Though of course, later, it was twiddled by accommodating hired gun lawyers lacking, one might note, many scruples). Meanwhile, a lot of meretricious nonsense about the magical properties of diversification of portfolios was promoted in Washington in order to change the law to allow the cartelization of banking, as if making absurdly large banking entities somehow "ensured" against risk as opposed to creating insanely overlarge and unmanageable conglomerates. Banks had been made stupid by FDR to begin with. Banks were nothing but paper pushing volume sales operations after the 30s because of the existence of Fannie—no longer sharp-eyed lenders with skin in the game scrutinizing debtors for their quality, just machines focused on volume sales, shoving whatever walked in that qualified, into Fannie's ready arms for taxpayer guaranteed securitization in the style of an assembly line). Antitrust law was for abotu 25 years under a cloud (ignoring antitrust happened to be in political vogue in Republican circles, merely because in some totally unrelated situations, there had been overreaching prosecutions or ill-considered breakups. Similarly, the noble goal of deregulation, which is still sorely needed throughout Washington, was misused to justify in the SEC and other ill run government agencies, total laxity and failure to enforce the law. By the way, excellent post Mr. Vukovich. Very well done. Thanks also for the explanation of the recourse rule. It should be self-evident to regulators that they may not pick and choose assets, much less "presume" safety of any of them (such as those "rated" AAA) on any bank's behalf. This is a bank decision only. Furthermore, no bank may be 100% government guaranteed against loss. Unless strictly limited to wisely chosen specific, as FDR did for commercial depositors only. If the government is the insurer, it is the principal and its investment decisions must not delegate to others with no skin in the game. It is a problem of economics -- the agency problem of economics. The integrity of such investment decisions cannot be trusted when banking entities have no skin in the game, for whatever reason, too low capital requirements, or implicit government guarantee. Thank you very much for your in-depth comment and analysis from a legal perspective. I have to say you added substance to my opinion on the interconnection between the politicians and the bankers, something I also touch upon in the paper (see chapter 6), however not as detailed as you have just presented here. I completely agree on your argument about Fannie. I picture it as an important culprit that led to an increase of systemic risk. In addition to all the regulatory policies that went hand in hand with the HUD's goals, such as the CRA and of course the recourse rule. I build up on the argument of its political protection and the extended hand of the Congress on the market in chaper 4.2. of the paper. As subprime and Alt-A loans became a larger and larger proportion of all mortgages in the United States, it was the purchases by Fannie and Freddie that drove this growth. The conventional wisdom—that they were trying to compete for market share with Wall Street—seems contradicted by the fact that Fannie and Freddie ultimately acquired nearly as many of these mortgages as the rest of the market combined. The more plausible way to look at the issue is that Fannie and Freddie were, by and large, the creators of the sub-prime Alt-A boom and that they did this for political reasons and not for the economic reasons that would motivate a Wall Street firm. "The SEC and banking regulators charged to protect the public against bad securities were so mired in petit detail and regulatory over-convolution in their massively stovepiped regulatory arena (being also relatively clueless and underpaid amateurs when it comes to Wall St), they didn't bother to notice that Fannie's securitization process had only been workable because..."
Monetary policy implemented and practiced by the FED in 2001 was a great mistake and a foundation of the unrealistic growth since 2001. In 2001 FED lowered the FFR 11 times in a row! The explanation was that it acted in order to give rise to liquidity to counteract the falling stock market that has experienced the "Dot Com Bubble". Naturally, all this massive liquidity found its way into the financial markets once again through structured products. Where did the structured products came from? Well, I believe that general computerization and internet-connectivity gave a very solid base to apply mathematical complexity in the financial markets - that could not be exploited before the rise in internet and cheaper computers for the public. GARCH, VAR models and Monte Carlo simulations gave a sense of security - false one. Financial products were built and risk assessment were being made on a simple and false precondition - low volatility(You can call it variance also here). So, everything was calculated in except the factor that was not! That factor was the shrinking housing sales market. Private equity was diminishing and with it - consumer spending. Exactly, in my opinion the idea behind MBSs was a brilliant one - have a diversified mortgage holdings around the country pulled into one huge bond that will give you a certain return always (since people always pay their mortgages). The biggest problem was failing to account for a fall in prices in the housing market. Further on, the basic idea that these were packaged by Fannie and Freddie to support HUD goals of promoting home-ownership to low-income classes, the fact that they were rated as risk-less securities (AAA) and most importantly that banks were incentivised to fill their assets with these securities resulted in an artificial demand for such bonds, and consequentially an artificial demand in the housing market. Yeah I agree, the whole system was built on one false or un-reliable premise - a long term private equity growth through rising prices of homes/houses. Also, USA housing market has an annual demand of roughly 1,3 million per year. In the period 2003-2007 excess output in housing created around +4,3 million units, while from 2008-2012 the sum of units produced underperformed by roughly the same amount. So, the housing development will grow with a healthy rate in the years to come. USA has another "elephant in the room" - its healthcare system/costs/size. I do believe that this is the next bubble. Anyway, I agree that the next bubble is to be found in the health care and I would add the social security system, if they don't get reformed. Btw, I'm curious, where did you get the data for the annual demand for housing? HUD? Yes, the monster fed the monster. First monster(housing)made homeowners feel "wealthy". Second monster(domestic spending/imports) was fueled by the possibility to extrapolate "wealth feeling" by translating it into loans based on homeowner equity. When You put in the calculation that most recent loans prior to 2008 were actually NINJA etc. loans - the picture is clear. NINJA loans made everyone feel wealth and even more so the ones that usually would not have a possibility of this feeling(due to under education, FICO score, excessive spending) suddenly had the possibility to spend. I would like to have a conversation on HFT(high frequency trading). HFT is purely quantitative method or using small time gaps or across the field arbitrages to find pairs that make risk-free profit. I have a problem with this practice. Stock markets, are a place that originally served as a point of providing finance to companies that will prove good and grow or prove ill and fail. That premise is simple, You pick the right one you make some money, serve as an example, other follow You, other companies follow the company that grew and "quality effect" spread all over the system. With HFT qualitative side has grown slowly but steadily out of the picture. Making profit fast with quality firms before is just making profit now and fast, taking the "quality" out of the equation. Maybe some comments on that? I have to admit that I don't know a lot about high frequency trading, at least not so much that I can make valid comments. From what you wrote, what is it that you're concerned with? That there's too much of HFT focusing on flipping a lot of firms? Being able to protect our income through an bill protection insurance in an unstable economy is important.